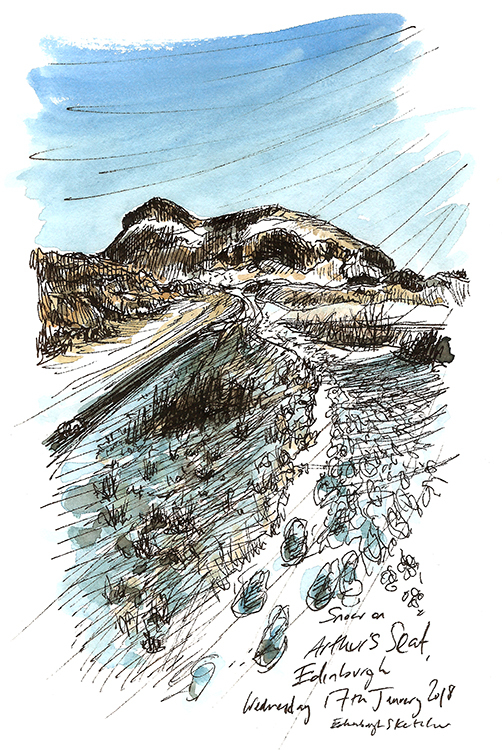 Yesterday I went for a walk through the crisp fresh snow which had fallen overnight on Arthur’s Seat. The capitals extinct volcano sits in Holyrood Park and enjoys fantastic views over Edinburgh. On this occasion however I did not trust myself to climb to the top in such icy conditions so instead walked around the hill to the crags from which I could see the view above showing Arthurs Seat to look like a mighty lion sitting looking out to sea. The sunshine but so bright from top right creating beautiful colours withing the snow, notably strong blue shadows which I tried to capture above. This sketch was drawn with ink and watercolour, using a Windsor & Newton paint set and Artgecko A5 sketchpad. Yes this sketch is available as a print for £18 or as with most of my daily sketches, the original A5 drawing is yours for £65. I will send you an email with more details. Love this…almost the view from our window! Is it for sale?